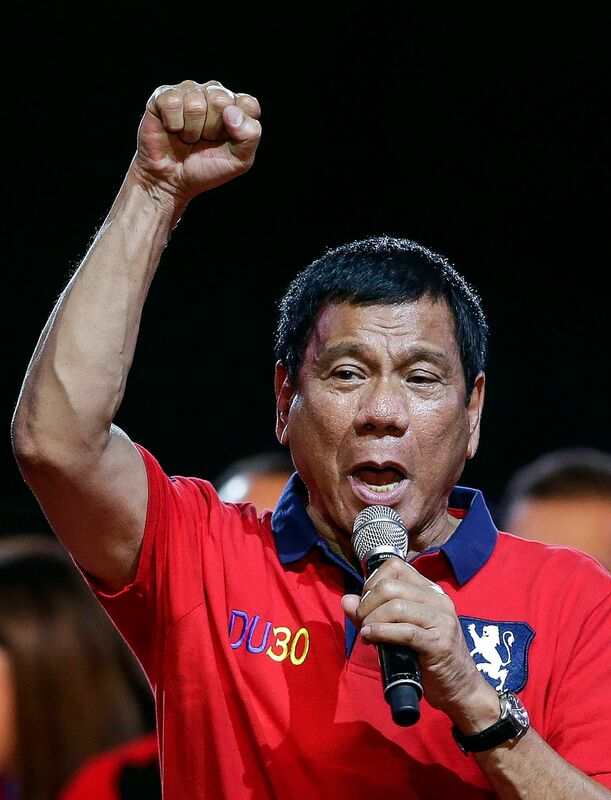 The spotlight is on the Philippines' new leader and the ripples he may cause as president. Here are excerpts from commentaries in newspapers in the Asia News Network. From almost nowhere, a dark-horse candidate sweeps past his fancied political rivals to surge towards the coveted national leadership. Loud, brash, crude, insensitive but irrepressibly popular, his unorthodox manner and disturbing pledges threaten as much as excite. The apparent success of his campaign is a test of both his political acumen and the democratic system that had enabled it. Thailand had that moment with Thaksin Shinawatra, and the US is undergoing it with Mr Donald Trump. One week ago, the Philippines embarked on that path by electing Mr Rodrigo "Rody" Duterte as president. Exactly what kind of government will such a personality make? Is his bite really as bad as his bark, and is that as bad as others have said it to be? The answers are still imprecise. There has been no shortage of warnings and alarm over Mr Duterte's pronouncements, or casual comments, on due legal process and democratic accountability. But since Mr Duterte's detractors include his political opponents, the warnings lack credibility. Mr Duterte's popular appeal to get tough on crime and criminals resonated with the people. If previous presidents had been as convincing in the task, his candidacy might have been in the balance. Another important aspect of Mr Duterte's popularity is his direct and unabashed style. His loudness and unpolished manner only helped to authenticate the apparent honesty of his content and delivery. In contrast, the middle-class special interests that his rivals had become identified with were a disabling liability. So when Mr Duterte championed the poor, in a society where the poor still needed championing, he came away with greater credibility than the other aspirants. Yet another edge that he held over his rivals as a candidate was that he was an outsider. As with Mr Trump and Thaksin, that made his attacks on a gridlocked establishment weighed down by sleaze more plausible. Now that Mr Duterte's victory has become a fait accompli for the rest of the country, critics and opponents alike are resigned to pondering his, and also their, next moves. Mr Duterte is smart enough to understand that the national economy is the make-or-break factor for any leadership. He is still untested on foreign relations. He has so far issued conflicting signals on how he would deal with an assertive China on disputed territory in the South China Sea. For the Philippines, the issue concerns more than China as it also involves the US and Manila's security treaty with Washington. Dealing effectively and satisfactorily with the issue demands a degree of perspicacity, nuance and sensitivity that has seemed elusive to Rody. But stumbling over it can also spell disaster for the new government. This, and how the Philippines will now position itself on the claim to Sabah territory among descendants of the erstwhile Sulu sultanate, will test Mr Duterte's statesmanship to the hilt. Rodrigo Duterte, the mayor of the southern city of Davao, has secured victory in the Philippine presidential election. He will officially assume office at the end of June when outgoing President Benigno Aquino III completes his six-year term. The Aquino administration pushed ahead with fiscal reform, created a favourable investment environment and achieved annual economic growth of about 6 per cent. These accomplishments are held in high regard internationally. However, dissatisfaction among the people about issues affecting their daily lives, such as widening income disparities, public security and traffic congestion, has likely enabled the outsider candidate Duterte to win the presidency. During the election campaign, Mr Duterte pledged to eradicate crime, starting with corruption. It is worrisome that although he has spoken about public security problems, he has not revealed any concrete economic or foreign policies. If Mr Duterte indulges in staying popular and opts for populist policies devised on the spur of the moment, the gains from Mr Aquino's economic development policies could be ruined. His course of action is not clear either over the issues involving the South China Sea, where Manila and Beijing have competing territorial claims. Although Mr Duterte has announced he would hold talks with China and conduct joint explorations for resources, he also rashly said he would ride a jet ski to an artificial island made by China and plant a Philippine flag there. The Aquino administration deepened cooperation with Japan and the United States, and has stood up to China. Accordingly, the United States will start de facto stationing of US forces in the Philippines under a military pact. Japan also will lease training aircraft used by the Maritime Self-Defence Force and is supporting efforts by the Philippines to beef up its surveillance capabilities. Mr Duterte must not forget that continuing cooperation with Japan, the United States and other relevant nations in the maritime security field is vital for regional stability. It has been a triumph of democracy in the Philippines, more specifically the victory of the Aquino legacy that was bequeathed to the country 30 years ago (February 1986). Yet in the moment of almost euphoric celebrations, there is a whiff of cynicism across the nation not least because of President-designate Rodrigo Duterte's reckless bombast and directly controversial utterances. Small wonder that his spirited campaign ahead of the election had somehow projected the man as either an emancipator or yet another ruthless dictator-in-waiting. There is little doubt that Mr Duterte has unnerved the Filipino electorate even before the results were officially declared. Further comment must await the evolution of governance under an ebullient head of state - at any rate his address to the nation which must of necessity spell out his agenda. The voters, as indeed in any part of the world, are looking forward to a president who will address the daunting problems of the nation. Domestic issues aside, his decidedly undiplomatic remarks about Australia, the US and China - all key players in the affairs of the Philippines - might impinge on his foreign policy. While he is yet to outline his diplomatic imperatives, he has described himself as a socialist who is wary of the US-Philippine security alliance. At home, he has unnerved the armed forces with his hint that communist rebels could play a role.